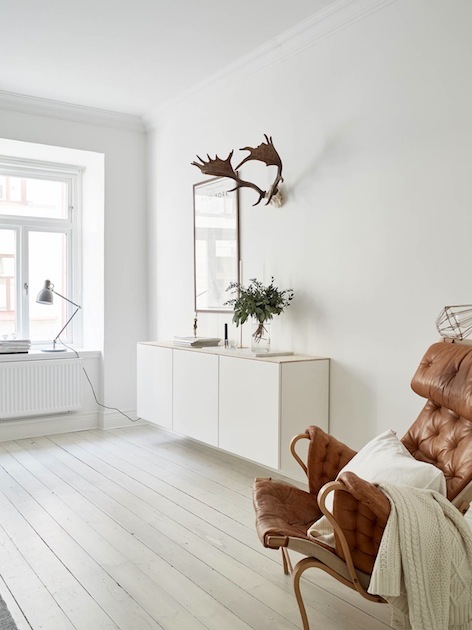 my scandinavian home: Could you wile away a morning in this lovely Swedish space? 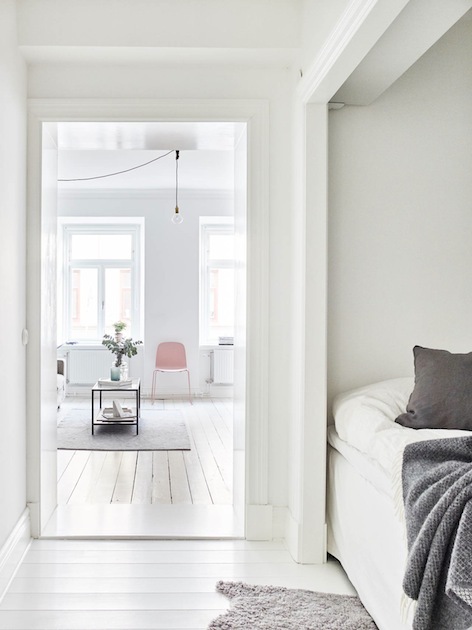 Could you wile away a morning in this lovely Swedish space? Hello! The new year's eve cobwebs have been blown away by the cold wind howling outside and I'm sitting under a cosy blanket at my desk with a steaming cup of freshly roasted coffee. Now that's the way to start work in 2015! This is going to be a good year. 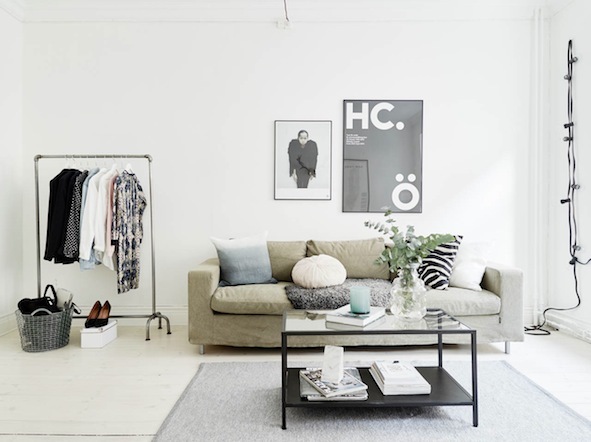 I thought I'd kick off with a lovely, uncluttered home in Gothenburg Sweden with white floors and walls. 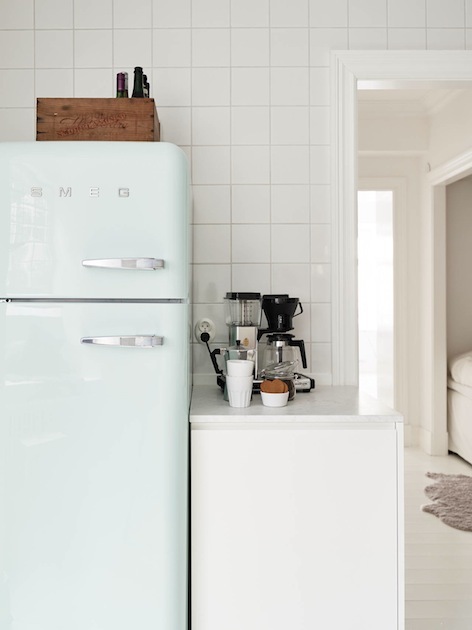 My favourite room is the kitchen with it's rustic table, brass bumling light, smeg fridge and window nook - what a perfect place to to wile away a morning don't you think? What did you like the most about this home? A few items I know and love: Kitchen - bumling light, Thonet 214 chairs, OMAR free standing industrial shelving, string shelves, sheepskin throw, smeg fridge. 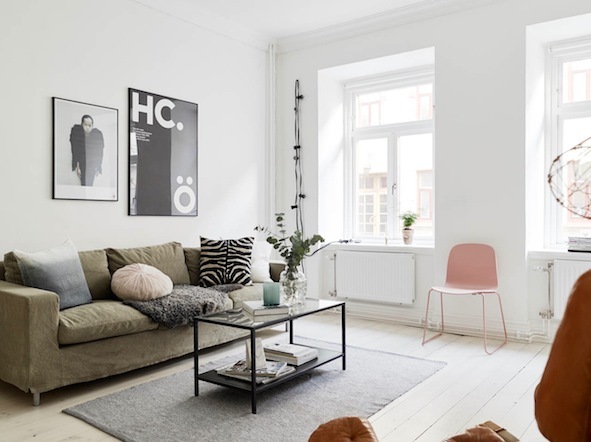 Sitting room: try Artilleriet for typographic prints, string lights by Granit, pink muuto viso chair in rose. Bedroom: this grey knit throw is similar. City of Champions print. 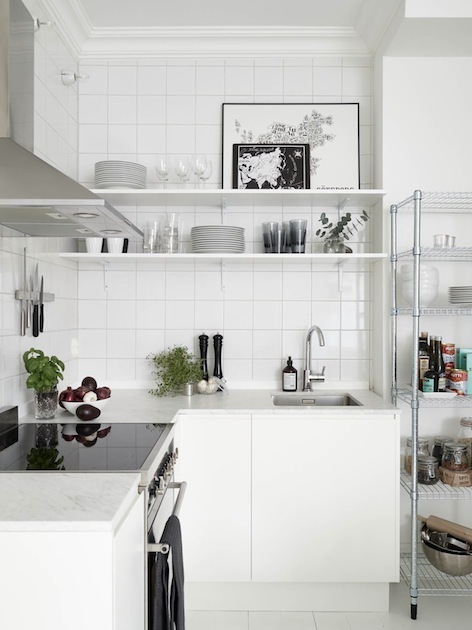 Other beautiful white and grey home tours include this and this and I also looove the black, white and grey home of skåne based Daniella Witte. PS In case you missed it - there's a free 2015 calendar from My Scandinavian Home ready for you to download and print out! Hiya! I've been following your blog for a few months now. It's really great, there is always so much inspiration! I'm currently rebuilding a old house and really love the scandinavian style, so everything I like I save for when I can start painting and decorating in a few months time. But I have a question; I noticed that most homes you show lack any kind of window treatment/decoration such as curtains. Does this have a reason or just a part of the style? And how do they cope with people looking in? Where I live it would be impossible not to have any window treatment if I want any kind of privacy. What would you recommend or what has your own preference when it comes to window treatment/decoration? Hi Sjo, thank you for your kind words about my blog :). The window dressing is a very interesting question and I'm so glad you've brought it up! Firstly, I have noticed living here in sweden that scandinavians do generally avoid heavy curtains - my theory is that light is scarce and heavy curtains will obscure natural light even when drawn back. However, if you look very closely at the windows in this apartment and others I show on here you'll notice a tightly rolled up white black-out blind at the top of the window. They are very discreet and don't block any light when rolled up, however when they are drawn down over the window they will block out all light and provide privacy. In my home we have the same black out blinds and also I've used some white linen curtains which soften a room and still let the light flood through, while providing privacy. At my parents house in england lined curtains are a necessity to keep out the cold, but our house in sweden is so well insulated that this isn't necessary. I hope this helps! Perhaps someone else on here can advise too? I had the same issue. I just made myself some grey linen curtains - they are lovely, I just tie them in the middle with a jute twine during the day when I need light. I placed three of them cause I have large windows. The linen lets a bit of light to get in though but being grey they provide more privacy during the evenings as opposed to white linen curtains. I love the sound of grey linen curtains, especially against white walls and white window panes. What a great idea! Where to start! Firstly, I love the kitchen. It looks so clean and fresh. I have dark worktops and wood cupboard doors and I hate them. I would much rather have white! Mind you, having kids would mean I would be forever cleaning! I also love the bed area. It looks so cute the way the bed is in that little alcove. Gorgeous! Love the simplicity of this home! 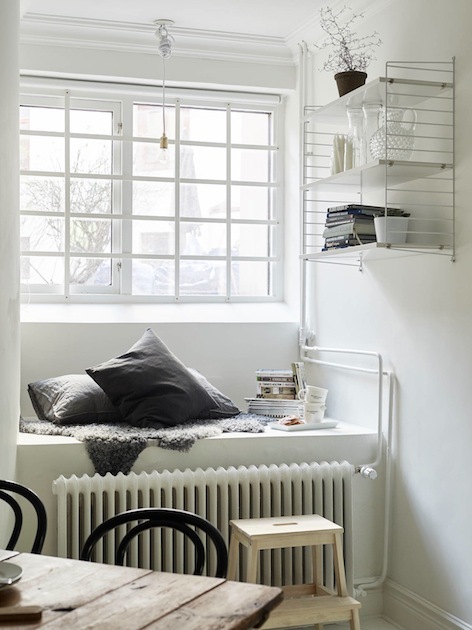 The window seat with the radiator below looks pretty cozy! I love this home.....the standout is the beautiful old wooden table in the kitchen. With the white it looks stunning. I love love your blog, I have been following you for over a year maybe two (time does fly). Your homes are a huge inspiration. I am building a farmhouse in Texas and have found your blog so helpful. Happy New year, looking forward to more great posts. Hi Sorry if you got my other message about the white floors, my ipod was playing up and not sure if it was sent. Anyway, here in England I had painted wooden floors in a bedroom white but even though they looked lovely to start with, it soon started to flake and scratch quite badly. 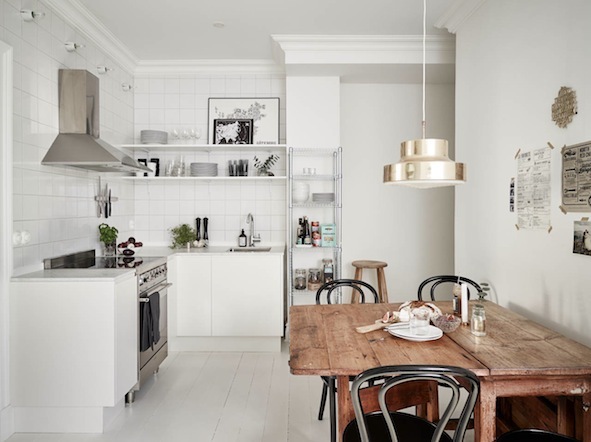 What is the trick for those white floors all over scandinavian style interiors? I did use floor paint but recently saw on tv a reactive paint special for garages mmm not sure it may look really shiny. Hi Gaby, I didn't get your previous message so I'm pleased you wrote again! Unfortunately I don't have the answer right now BUT I am actually planning a white floor right now. I hope to be able to document it in a post and provide some tips....I'll come back once I know more - in the meantime perhaps someone else on here can help?